Black gloss timber TV cabinet with doors for up to 55 inch flat screens – 1200mm wide, 2 x remote friendly glass doors. 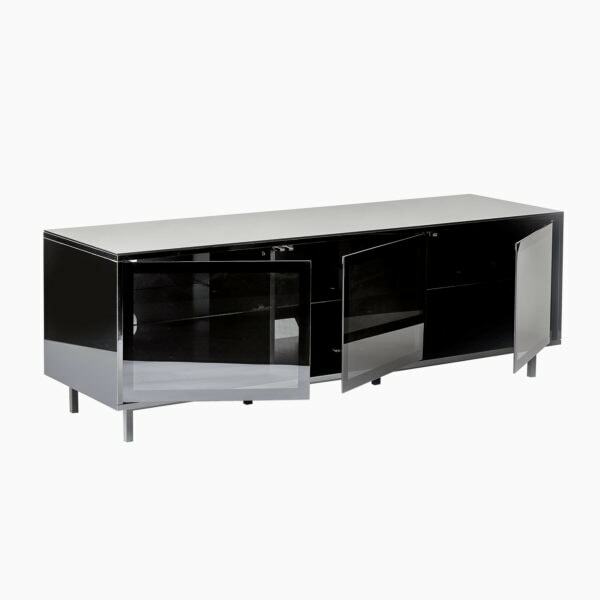 The DDSETVC-1200BLK is a modern TV cabinet finished in stylish gloss black, with minimalistic glass door frontage. The cabinets 1200mm width allows it to hold the latest 4k TVs with a screen size up to 55″. The smoked glass doors open to reveal 2 spacious equipment compartments, each with its own adjustable glass shelf.